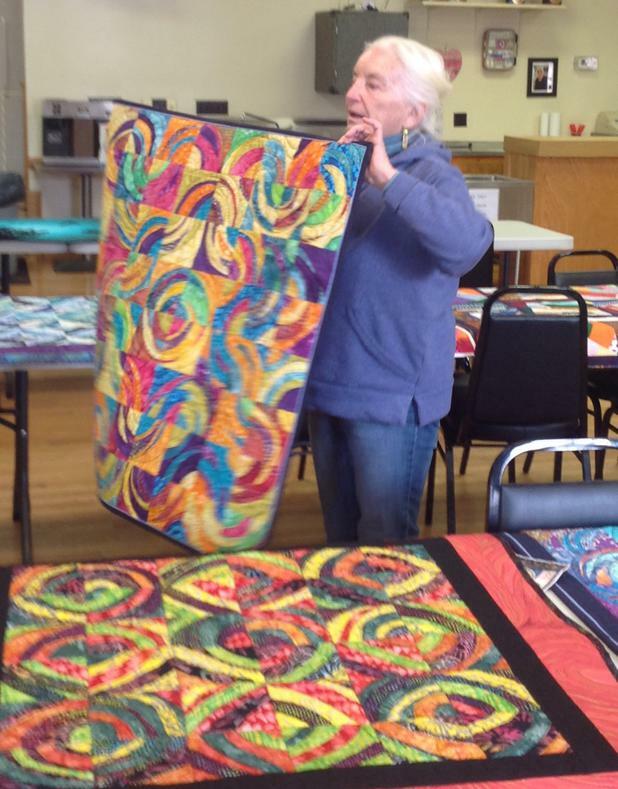 The Delectable Mountains Quilt Guild (DMQG) is a volunteer club of quilters who create a variety of styles from traditional to art, teach new quilters and new techniques, contribute to the community and enjoy the friendship of other quilters. 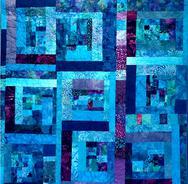 Annually DMQG stages a quilt show at the Ice House in Berkeley Springs that includes a Yard Square Quilt benefit auction for a local charity. We participate in the county's Apple Butter Festival and EXPO. 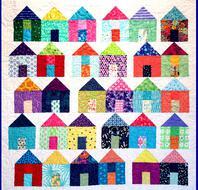 We also have members involved with Quilts of Valor. This collection of pictures that graphically tells the story of our many activities, introduces some of our members and celebrates where we live. 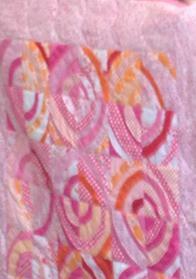 Included is an introduction to our Yard Square Quilts. 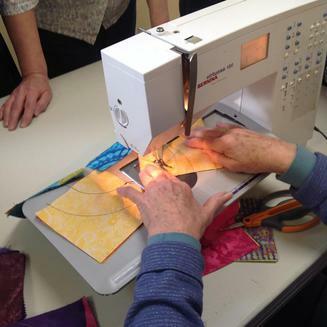 As part of our Wednesday, March 6, 2019 meeting we had a special lesson showing us how to create a "Coming Around Again" quilt. Jane Frenke taught us this Stack-Sew in Curves-and-Cut Out technique. It is similar to cutting a layered Mola. Shown here are several versions that will be included in our 2019 Yard Square Quilt Collection. The curves that make up the technique can clearly be seen in this photo. 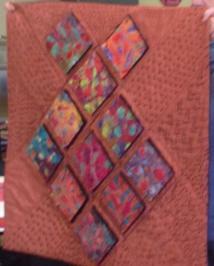 The one on the table is a Yard Square created by Denise Cline. Its is called"Stepping Stones." 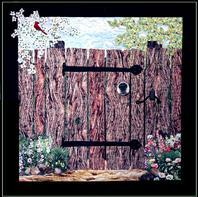 A gleeful pink, red, and orange Yard Square Quilt by Linda Gee called "In the Round." One of the best charteristics of this technique is it varibility. Above: Abby Chapple loved the individuality of each layered group so she put each on a raised, 3D platform, like a jewel in a setting. Hence the name, "Jewels." 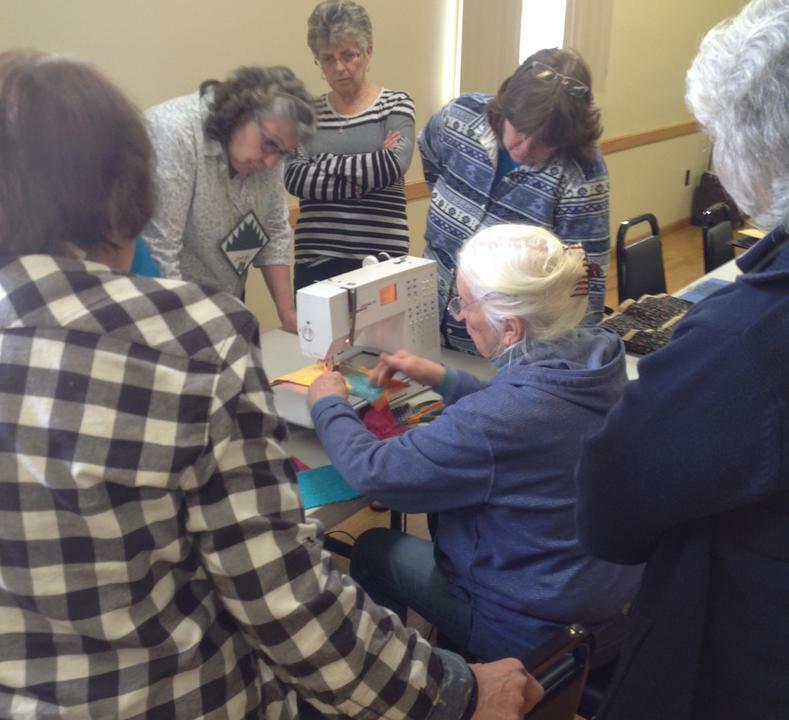 Members watching Jane Frenke at the sewing machine, from left to right: Linda Gee, Carolyn Taylor, and Dottie O'Toole.